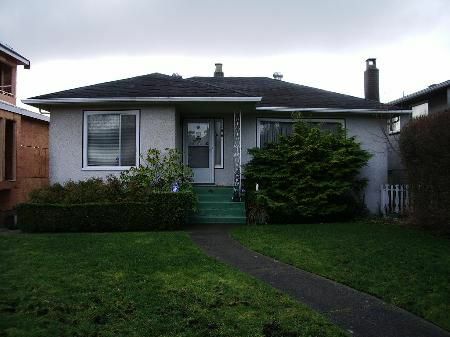 RARELY AVAILABLE 4938sf Building Lot in prime Oakridge area. Build your dream house on this south-exposed lot, on a quiet street within short walking distance to the Canada Line, Oakridge Mall, Columbia Park, Tisdall Park, YMCA, Langara College. This is a great family area, in the Van Horne Elementary, Eric Hamber Secondary School areas - Quilchena Elementary and Churchill Secondary for French Immersion. NO VALUE in the house, property to be sold "AS IS". The Buyer MUST allow the Seller to remove a piano in the basement prior to demolition. Please allow 8 weeks for Completion (April 1st is ideal). OFFERS, if any, on Sunday January 30, 2011. Seller states that he paid for the professional de-commissioning of an oil tank in the backyard in mid-1970's. The Buyer should satisfy themselves as to this issue.